Want a Straight Smile? Compare Veneers and Clear Braces in Fort Collins! These days, it seems like everyone you meet has a straight, even smile. But very few people are actually born that way and wind up needing orthodontic treatment at some point. However, in the last 20 years more choices have become available than ever before. In fact, some people can simply use veneers to straighten their smile and avoid orthodontic work altogether! But that doesn’t leave traditional brackets and wires as the only other choice. Clear braces in Fort Collins are another alternative that people with more significant issues can use to get great results. Keep reading below to get information about both and learn which one might be right for you! How Do Porcelain Veneers and and Clear Braces Compare? Porcelain veneers – Veneers are semi-permanent, strong, thin “shells” that are adhered to the front surfaces of the teeth to give them a new appearance. Clear braces – Clear braces rely on thin plastic trays to move the teeth instead of brackets and wires. Generally, one set of trays is worn for 2 weeks before moving to the next set. Porcelain veneers – Veneers are typically finished in 2 appointments. At the first appointment, impressions are taken and temporary veneers are adhered to the teeth. Then about 1-2 weeks later the semi-permanent veneers will be put on. Clear braces – This can vary widely from a few months to 2 years, but the average treatment time is 6-12 months. Porcelain veneers – The cost of porcelain veneers varies from place to place, so there’s a range of costs between $925-$2,500 per tooth. In some cases, just 2 veneers can be used to correct crowding or gaps. 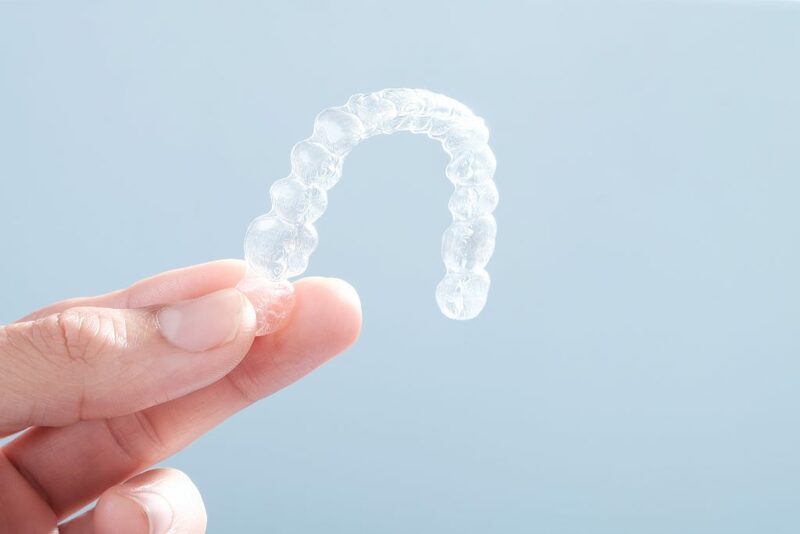 Clear braces – Again, this will depend on geographical location, your treatment time and other factors, but a good ballpark estimate for Smart Moves clear braces is $1,600 – $2,500. Porcelain veneers – With basic maintenance like good oral hygiene habits and regular checkups, porcelain veneers can last an average of 15 years. Clear braces – If you get clear braces and wear your retainers as directed, your results will be lifelong. Every patient is unique, so the best way to know which option will give you the best results is to schedule a consultation with a cosmetic dentist in Fort Collins. One of the main factors they’ll be looking at is the type and severity of the problem you’re trying to correct. Veneers typically work best for minor cosmetic issues like crowding and gaps. Now that you know more about these options, you can ask the right questions at a consultation and get one step closer to having the straight smile you’ve always wanted! Dr. Shiloh Lindsey is a general, restorative and cosmetic in Fort Collins who understands that orthodontic treatment isn’t a one-size-fits-all approach. That’s why she offers multiple options so that everyone has a way to get great orthodontic results as quickly as possible. If you have any other questions about veneers or clear braces, she can be reached via her website or at (970) 482-3166. Comments Off on Want a Straight Smile? Compare Veneers and Clear Braces in Fort Collins!